What is Notalgia Paresthetica (NP)? 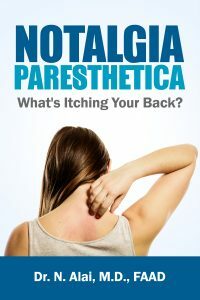 Notalgia Paresthetica (NP) or Notalgia is a localized itch of the middle of the back that comes and goes. Notalgia usually affects only one side of the mid back, often just past where you can easily reach it. What causes Notalgia Paresthetica ? Notalgia’s exact cause remains unknown. Notalgia is thought to be caused by a problem with the neck. Notalgia seems to be caused by an underlying neck problem like a bulging neck disc, pinched nerve, and/or muscle spasm. What are symptoms of Notalgia? Symptoms of Notalgia include a very annoying, intermittent, almost painful itch of the middle of the back. Notalgia is an itch that later forms a rash from the scratching and rubbing that inevitably ensues. If you don’t scratch the area, there will be no rash. After some weeks or months of scratching the same area, a pink or brown rash is seen in the mid back. Usually, Notalgia is just under the bra strap in women and many women think they have become allergic to their bra. Why does Notalgia Paresthetica affect one side of the back? Although the problem is typically in the neck, Notalgia causes a referred itch via the nerves to the middle of the back at around the T2-T6 level. There is usually no problem or pain in the thoracic spine. What does Notalgia Paresthetica mean? The term Notalgia is derived from the Greek root word notos, meaning “back,” and algia, meaning “pain.” While it is not exactly a pain in the back, it does cause a mix of a painful itch that is hard to relieve even with scratching. Notalgia paresthetica (NP) or Notalgia has also been called “posterior pigmented pruritic patch” and nicknamed “PPPP” or “PPP”. Some people misspell it as nostalgia. Notalgia is one of a group of spinal neuropathies and is also called a neurocutaneous syndrome. and as a sensory neuropathic syndrome of the back skin, classically affecting only one side of the back just below the scapula. NP is an “itch that rashes”; localized itching leads to the secondary excoriations and chronic skin changes. While previously defined as strictly isolated to the mid back, NP in more advanced stages has more recently known to be potentially more widespread in distribution, and often associated with transient bouts of itching on the upper back, extended bilateral mid back, shoulder(s), one or both arms, scalp, neck, and face. NP is most likely a “downstream” manifestation of an “upstream: cranio-cervical condition. In figures above, NP itch is often noted to affect one side of the back (B) and the opposite(C) arm/forearm and/or shoulder. Notalgia is very common in adults and elderly. It is not usually seen in children. Notalgia is most commonly seen in individuals with some type of neck trouble and potentially a history of whiplash injury(ies), car accident(s), heavy lifting, computer work, other neck injuries, arthritis, fibromyalgia, and hyperspastic muscles. About half or more of people with Notalgia know that they have pre-existing, mild to moderate neck problems and/or muscle spasm. The other half of individuals with notalgia either don’t feel neck pain or have referred pain to the middle of their back. Does everyone with neck (cervical) problems develop Notalgia? Only a small number of people with diagnosed cervical problems actually develop Notalgia. While studies have shown that many perfectly normal individuals have undiagnosed and asymptomatic cervical (neck) disc disease and naturally aged (degenerative) changes in the neck spine, Notalgia is described in much higher incidence in individuals with degenerative or age related changes in their neck spine. Notalgia tends to occur more in individuals who inherently have a lower threshold to itch including those with any atopy (allergies, eczema, asthma), hypereosinophilia, hyper IgE, autoimmune conditions, hepatitis C, multiple sclerosis, and kidney disease. Notalgia feels like a painful itch in one area in the middle of the back. It is primarily a localized nerve related, deep seated, burning type itch. People with Notalgia describe episodic itching, stinging, numbness, or atypical pain on a small patch of the mid back, usually an area of skin just past easy reach. Often, the itch can best be described as a deep seated itch, arising from under the skin. Many cases are diagnosed in women who describe their mid back irritation originating from the bra strap. People with Notalgia often do not recognize their symptoms as having a medical association and rarely present to the doctor with their complaints. Many attribute their symptoms to laundry soap, or a clothing tag or bra allergy. Will my doctor know that I have Notalgia Paresthetica ? Most doctors may not be familiar with this condition. Notalgia is heavily under-reported by patients, largely under-recognized and under-diagnosed by medical professionals. You may want to see your dermatologist as a starting point for diagnosis of Notalgia since dermatologists are the specialty trained to recognize these symptoms. Your dermatologist may be able to help refer you to appropriate therapy and spine specialists. What does the Notalgia Paresthetica rash look like? Early notalgia is an invisible itch and has no rash. In more advanced or chronic stages, Notalgia may be associated with a poorly dileaneated tan or brown patch in the middle of your back. There may be red bumps, scratch marks, and small sores in one area on the middle of your back. While Notalgia is typically controllable, it is not necessarily curable. Because of the underlying neck and upper back nerve issues, Notalgia tends to be a chronic condition with periodic remissions and exacerbations. Very early stages of notalgia may clear fully with appropriate spine therapy, and lifestyle and posture modifications. While not life threatening, Notalgia frequently decreases quality of life, causing much discomfort and nuisance to affected individuals. Is my arm itching related to my Notalgia? Notalgia is frequently associated with other localized itch syndromes like brachioradial pruritus (BRP) which is a periodic itching on the outer forearm skin. Often Notalgia occurs together with BRP or sequentially in the same individuals. Treating the neck will often releieve both your notalgia and arm itching. Notalgia is known to occur sometimes in hereditary or familial patterns. It has been known to run in families but the genetic mechanism(if any) remains to be determined..
What other medical conditions are seen with Notalgia Paresthetica ? Often Notalgia is in otherwise very healthy individuals. Notalgia has however been associated with other medical issues including Hepatitis C , kidney disease, multiple sclerosis, multiple endocrine neoplasia (MEN), and benign cysts of the brain and spinal cord like arachnoid cysts and spinal syrinx. Notalgia is also seen more in scoliosis, improper spinal curving from poor posture, loss of proper neck curvature, and multiple whiplash injuries often sustained through distant past or recent motor vehicle accidents. What is the best treatment for Notalgia Paresthetica ? The best treatment for Notalgia is neck therapy. Therapy may be different depending on the underlying cause of your Notalgia but may include spinal adjustments with a chiropractor or osteopathic physician, massage, acupuncture, transcutaneous electrical nerve stimulation (TENS) home treatment, electrical muscle stimulation (EMS), and infrared heat to the neck with a good physical therapist. Skin creams and lotions applied to the back skin work very little is at all in Notalgia. Since the problem comes from deeper nerves, skin numbing creams or cortisone creams may help minimally to reduce skin symptoms. Prior to advancements with the latest research in Notalgia, older therapies simply did not work very well. Failed past therapies may be attributed to the fact that treatments aimed primarily at the back skin, and not at the underlying spine and nerves. Similarly, since most Notalgia cases are associated with cervical spinal and muscle disease, there are no uniformly effective treatments for cervical ailments. Notalgia therapy has to be individualized based on what is causing your neck issues. For example, most people just have spastic neck muscles or “myofascitis”, carry a lot of stress and tension in their neck, and work with their neck flexed down. They can be treated with simple steps like adjusting their work space and posture, massage therapy, physical therapy, infrared heat, and TENS or EMS to the neck base. Other Notalgia individuals have severe neck disc disease with severe cord compression at the middle of their neck. These individuals would need immediate consultation with a neurosurgeon or orthopedic spine surgeon prior to undergoing any other neck therapies. What are the main symptoms with Notalgia? The main primary symptom of NP is a localized, moderately deeply seated painful itch on the mid back, right under the shoulder blade. There is often an episodic and annoying itching, burning, stinging, tingling, generalized discomfort, numbness, or atypical pain on a small patch of the mid back, usually at a round patch of skin just past easy reach. Additional symptoms include hypersensitivity (hyperalgesia), hyposensitivity or relative numbness (hypoalgesia), and/or burning or pins and needles sensations (dysesthesias). Often the Notalgia patch of skin becomes slightly numb (with a decreased sensation to touch and pinprick in the skin) while there is a paradoxical hypersensitivity to itch. Often patients scratch the area very hard without realizing or physically sensing how deeply they are excoriating and breaking open the skin. On a basic symptom level, the largest majority of patients with Notalgia often do not recognize their symptoms as having a medical association and rarely present to a doctor with their complaints. Many Notalgia patients attribute their symptoms to numerous causes including laundry soap, clothing tag allergy, bra strap allergy, and elastic band irritation. A very large proportion of Notalgia cases are diagnosed in women who describe their mid back irritation originating from the bra strap. In more advanced or chronic stages, Notalgia symptoms include a poorly circumscribed tan or faintly pink patch, brown or tan (hyperpigmented) patch, or a lacy pattern (reticulated) colored patch in the symptomatic mid-back area. There may be old scars in the area and/or fresh scratch marks. Long standing Notalgia symptoms include thickened skin (lichen simplex), “picker’s warts” or small rough skin bumps(prurigo nodules) on the back. The exact cause of notalgia paresthetica is still unclear. Recent studies have shown that the possible causes include a upstream neck problem, particularly in cervical spine C4-C7. Alai et al in 2011 published the first collaborative case report between dermatology, orthopaedic surgery, radiology, and internal medicine. This study objectively demonstrated the clinical association of neck spine and disc problems, and Notalgia. Alai’s study also showed that cervical spine symptoms are referred to the mid back skin. Prior to this report, much of the NP research and treatment had focused on possible T2-T6 as the cause of NP. Study by Alai et al: NP Right Mid back with small bruise from scratching. 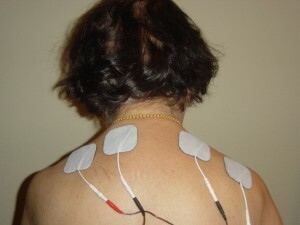 New treatment with 4 TENS electrodes placed on upper back at neck base. A study by Savk et al in 2003 showed that more than half of their patients had significant x-ray changes in the vertebrae corresponding to the dermatome of the skin rash. All the study patients demonstrated normal neurology findings and standard electrodiagnostic results. Springall et al in 1991 concluded that the symptoms of notalgia paresthetica may, in part, be related to an increase in the sensory epidermal innervation in the affected skin areas. Skin biopsy studies showed that the skin changes in a few Notalgiacases were lichen amyloid. Lichen Amyloid is a common secondary skin change seen in other skin conditions and is caused by localized chronic scratching and rubbing. Can Notalgia onset before or after Brachioradial Pruritus? Yes, both. There is a definite and close relationship between notalgia paresthetica (NP) and brachioradial pruritus BRP). Clearly, both BRP and NP are types of localized itch syndromes. The recently described association of many cases of brachioradial pruritus and cervical spine disease and descriptions of the disease as a possible neuropathic/neurogenic condition also support a probable neuropathic association with notalgia paresthetica.In contrast, notalgia paresthetica is generally unilateral, while brachioradial pruritus may involve the unilateral or, less commonly, bilateral upper extremities. Notalgia paresthetica is an extremely common disorder and remains largely under-reported, under-recognized and heavily under-diagnosed. Therefore, the true frequency of NP may not be accurately reported. NP is described worldwide in persons of all races but has a reported mostly in females. NP is seen in the United States and worldwide. National variations have not been described. What causes the patch of skin to itch in Notalgia? Much of localized itch complaints, and particularly non-specific, fleeting itching of the mid back, arm, neck, scalp, and face may in fact be similar skin signs of underlying spinal and spinal muscle problems. Although much less common, localized itching and paresthesias (numbness/ tingling) of the lateral thighs (meralgia paresthetica) and feet may similarly be heavily under-recognized as related to spinal and spinal muscle pathology. While not life threatening, NP frequently decrease quality of life, causing much intermittent discomfort and nuisance to the affected individuals. Typical cases of NP tend to remit and recur. Less cases of NP are severe, debilitating and disabling to the affected individual. NP may be asignal if underlying advancing neck degenerative changes, possible upper extremity weakness, and future progressive nerve issues. What skin rashes are seen from Notalgia? Notalgia causes secondary changes in the skin from chronic scratching and picking at the back skin,. These skin changes include prurigo nodules, lichen simplex chronicus, skin breakdown, scarring, post inflammatory hyperpigmentation, macular and/or lichen amyloid, and secondary skin infections. Does Notalgia cause longstanding problems? Yes, Notalgia has increased medical concerns because of the probable underlying cervical spine disk disease. Notalgia tends to be a chronic condition with periodic ups and downs. What other medical conditions are seen with Notalgia? Is Notalgia more common in Caucasians/ lighter skin? Why do more women seem to have Notalgia? Notalgia paresthetica is seen in both males and females.